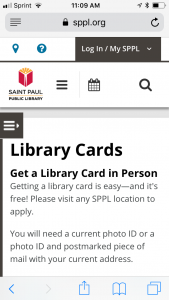 The new SPPL.org was built to be mobile-friendly, so you can do all of the same things you can do on a desktop or laptop computer on your tablet, smartphone, or other mobile devices. The library's website is responsive, so it adapts to the size and orientation of whatever web browser or device you are using. On smaller screens, some items will condense to be represented by icons on the page, but all the features of the site are still available to use, including the catalog, events calendar, and digital library. On small screens and on tablets rotated to a vertical orientation, the catalog and website search functions are available by tapping the magnifying glass icon. The events calendar is represented by a calendar icon. Tap the three horizontal lines to reveal the menu for browsing the other contents on the website. On mobile devices, all of the information you see on a full-size screen adjusts to be available in one scrollable column. 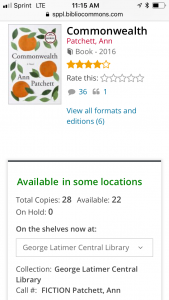 In a catalog record, you will see an item's cover, title, author, and publication date above the availability information and "Place a hold" button. Scroll down the page for all the information you would see on a desktop computer screen, like full record information, reviews, and more. SPPL also has a mobile app, available for iOS or Android devices. With the app, you can stay logged in on your device so it's quick to check due dates and other account information on the go. Find directions to the library or place a call to the library with a tap. 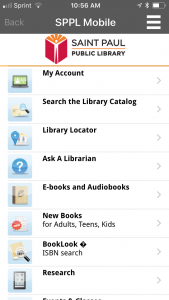 The app also features BookLook, which lets you scan ISBN barcodes on books to see if they are available at the library.